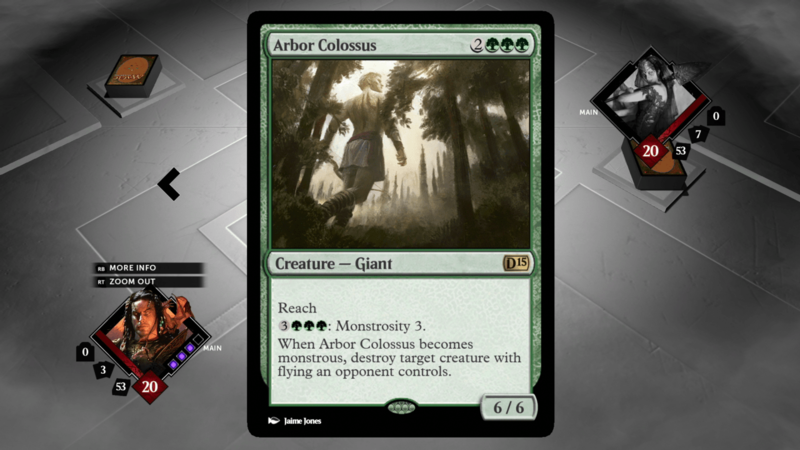 It’s that time of year where the annual release of Magic the Gathering’s video game series is upon us. 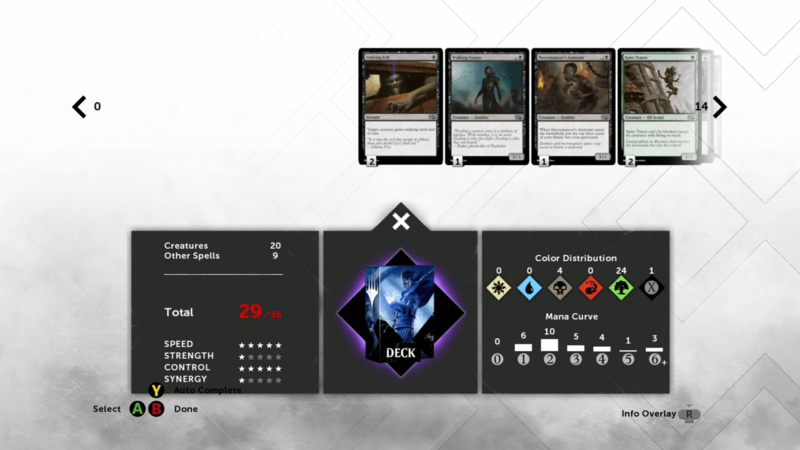 Magic 2015 – Duels of the Planeswalkers aims to be the very best trading card based game in both the real world and the digital one. 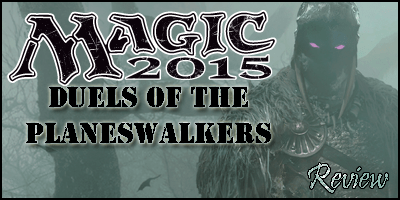 Currently number one amongst the physical world, can they be sure Magic 2015 DotP delivers on the digital front? Are the improvements, if there are any, worthy of purchasing the latest instalment on Xbox 360? For the uninitiated players, the game comprises of using a deck of cards which consists of one or more magic colours (red, white, black, blue and green) and using this you battle your opponents to take their life counter down from twenty to zero. How you accomplish this goal could depend on how much mana you possess on the battlefield, which in turn allows the use of creatures, spells etc. As each player take turns in playing parts of their hand, it’s a real battle of wits, playing a specific card too early or late can offer an opponent an opening to finish you off. In case my brief description of how to play isn’t as enlightening as I had hoped; fear not because there is a tutorial present within the game. Even though I have three years of experience under my belt, this is the most in-depth and simplified tutorial I’ve seen from Magic so far and it served as a decent refresher. Not only does it cover a few scenarios and generally what to do when you’re in a bit of a pickle but also explains the benefits and style of each colour which even helped me out. Once you’ve used these skills in a duel to graduate from training you get to choose a preset deck based on how you wish your play style to be. Then it’s time to begin your journey to track down Garruk Wildspeaker whose mind has been turned towards the dark side. The great hunter becomes your prey. Along the way you’ll encounter strange creatures and familiar faces such as Jace and Liliana all appearing to block your path until you can convince them to guide you towards the final destination. This year’s Campaign seems to feature additional animated videos throughout to tell the story which I’ve been hoping they’d do. Such a seemingly simple touch brings the tale to life and makes it feel more captivating than ever before. You cannot go online until you’ve at least completed a few battles in the Campaign but that’s not necessarily a bad thing. By winning duels you can earn booster packs containing cards you can then use to mould a deck to suit you. Although the pre-set decks are still lingering, it’s all about creating a customised deck to suit your own personal battle needs. This encourages players to engage with the Campaign in order to unlock more cards to offer themselves better options for constructing a deck, especially if they want to beat Garruk or online competitors. The customised decks are a huge positive from my perspective; mixing and matching different colours or focussing an entire deck on a quick attack plan adds another level of mental strength. Should you find an opponent too tough, it’s easy to set up another new deck that seeks to counter the types of sorcery or creatures you face. Sadly, whilst this enhances the Campaign it comes at the expense (though not directly) of two modes from last year, Challenges and obviously Sealed Play are gone. You wouldn’t notice however as it’s been equally enjoyable if not more so without these modes. Luckily it’ll take you numerous hours to unlock all the trading cards in the game and this will pass the time until you are ready to take on the world. Fancy testing your hand against the best the world has to offer without leaving your house? Jump online then with your deck of choice, custom or pre-set and take on up to three opponents at once. Whether you want a Ranked Match or Player Match you can join or create a one on one duel (1v1), triple threat style encounter (1v1v1) or a fatal four way (1v1v1v1). It’s difficult to predict what a human player will do or what will be within their deck so there is no better nor rewarding duels than these. Remember Two-Headed Giant mode from previous titles? Well that hasn’t survived the chop, now there are no ways to tag team with a friend against another due which is a shame as it was easily one of the better game types. It’s also quite tough to find a 4 player battle, whereas the other two types I got in and found one first time round. That’s slightly disappointing only a week after release to say the least. The only worry I have is the game’s stability during the menu and loading screens. There’s far too much stuttering and lag when navigating through the screens but it never causes a complete freeze up. Surprisingly once in a duel you won’t even get the slightest hint of delay whether online or offline. Whether you should buy it or not doesn’t have a straightforward and simple answer. Whilst there aren’t many major visual changes, it’s building a complete trading card Collection for custom decks that adds real value. Do you have a slight interest in the trading card genre? Does the idea of strategic play and planning a few moves ahead like a game of chess entice you? If the answer is yes to either then I’m sure that at £7.99 you’ll get more than your money’s worth out of Magic 2015 as I’ve already hit the 20 hour mark without a slight hint of boredom.